DBS Providers are a special group of business owners and entrepreneurs who desire to offer training for their customers. They are responsible for running the business side of the school and may include motorcycle dealers, after-market retail operators, track owners, casual off-road rider, current MSF street or ATV Schools, or DBS Coaches with business expertise. 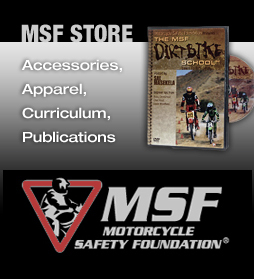 Besides enjoying the challenge of running a business, they support their students and riders by providing them with valuable techniques and safety skills for riding off-road. MSF and DBS Providers enter into an agreement that outlines the rights, responsibilities, and privileges of each other’s role in the relationship. DBS Providers are responsible for obtaining suitable sites to conduct DBS Classes. Each range must be certified by MSF that it is not near another DBS site. View current site locations. Close Range Exercise (CRE) ranges are used to conduct the entry level course on a small flat lot utilizing a grass or dirt hard packed surface, with minimum dimension of 150' x 200'. Introduction to Trail Riding (ITR) ranges are used to conduct on-trail riding exercises and learning. The trail system is usually 5-10 miles in length. Scheduling their Coaches and classes, etc. Ready to become a DBS Provider? Call 888.OFF.HWY1 (888.633.4991) and select option 2.